Very cool; I’m assuming you get the value of the lounges too? For the Club card, don’t forget the 2 free checked bags for 2 travelers–4 bags total. That’s 2 more bags than with the regular card. Useful if you can’t seem to pack light, or you have a larger family traveling. Our family totals 3, so this gives us a benefit when flying coach. Couple of other perks worth mentioning: free cancellation/interruption trip insurance (10k/person up to 20k/trip) plus free primary LDW on car rental up to 31 days (Amex charges $25 but gives you up to 45 days coverage). I get value out of both of these last ones. I’m not sure if the math is correct for the spend convergence point where the best value shifts from Explorer to Club. Using $0.0376/mile, it looks to me like it happens right at $35,958 (not $28,700). The 7,979 miles difference at that point finally pay for the $300 difference in annual fee. I don’t see the point in using the $0.0376/mile number at all. It doesn’t seem to correspond to any real value. No one (in their right mind) should ever buy United miles at $0.0376/mile, and although it is probably possible to redeem United miles for that value in certain circumstances, you can’t say that it is always the value of United mileage resumptions, right? By valuing the miles that high in this exercise, you actually bias in favor of the Club card, to leverage relatively fewer more miles into enough value to pay for its high (but fixed) annual fee. If you were to do the same exercise valuing the miles at FrequentMiler’s Fair Trading Value of $0.0138/mile, Club needs a whopping $63,479 of spend to pull even (and then pass) Explorer. Obviously, as mentioned, there are other benefits to the Club card, but looking at it from a mileage value perspective, Explorer seems to have Club handily beat for most normative levels of spending. Thanks for your comment. As far as the math, I approximated how many miles you would have to generate, to offset the annual fee, Looking over again, if you include the 1.5 mile per dollar, at $28,666.67 spend, you generate 43,000 miles, which, is $1616.80 if valued at the “Direct buy” cost, if you subtract $1,221 from that, you get $395.80, which, albeit is $0.80 more than the annual fee. If you spend $35,958, you generate 53,937 miles, which at the direct buy cost is $2,028.03, significantly more than you’d need to just meet the equivalent value of the Explorer card. Your point on no one (in their right mind) should buy United miles at $0.0376/mile is a very fair and true point, however, if you go back to my first post on the subject: http://saverocity.com/taggingmiles/pursuing-united-miles-credit-card-spend/ , you’d see that I was trying to compare a cash back card (the Barclay Arrival Plus) to a mileage earning card. While its true that I could’ve used FrequentMiler’s Fair Trading Value of $0.0138/mile. 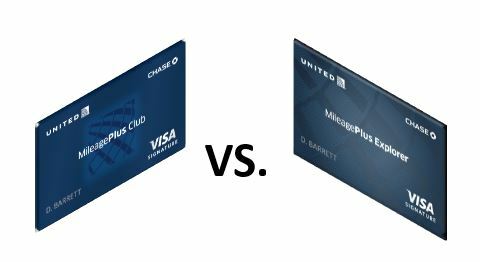 The problem I ran into with that comparison is that you really can’t buy United Miles for $0.0138, so from the perspective of a cash back card, it didn’t work. For that reason I attempted to keep the math consistent between the two posts. If you want to know the spend point at which the Club card finally reaches the mileage value of the Explorer at $25,000 spend, then yes – you are correct: $28,666.67, if the mileage is valued at $0.0376. If it is valued at $0.0138, you’d need to spend $37,826 on the Club to equal the value on the Explorer at $25,000 spend, after the annual fees. But if you say, let’s put the same spend on both cards, and at what point does the Club finally overcome its annual fee and pass the Explorer for mileage value, then the calculation I gave before is correct – $35,958 of spend on each card balances them for value if the miles are $0.0376 each, and $63,479 is needed to balance them if the valuation is $0.0138. You are right that you can’t actually purchase the miles for $0.0138; the true value is likely somewhere in between the two numbers, which still puts unlocking mile-based value from the Club card well out of the reach of most people. Ah – yes, I see your point on balancing spend. I was going on the idea that it made no sense to spend anything more than $25k on the Explorer card (get your threshold spend, and move on to another card). Regarding true value, yes, you are completely right, it is somewhere between the two. Even if you could get $0.07 per mile (and I have), I wouldn’t value them that high. I think you’re right, the club card, purely from mile-based value is out of reach for most, and those of us who MS see the marginal value in switching out cards to meet various thresholds.